This performance of Beethoven’s Ode to Joy was sponsored by the Sabadell bank in Spain in honor of the 130th anniversary of its founding. It is headquartered in Alicante, Spain, so that is probably the location of the performance. The bank was founded Dec. 31, 1881. The enduringly popular Big Noise from Winnetka was created spontaneously by members of a band called the Bobcats performing at the Blackhawk restaurant in Chicago in 1938. When some of the members of the bank were late getting back from a break, composer and bass player Bob Haggart and drummer Ray Bauduc started improvising. It was such a hit that they made a recording, and performed it many more times through their careers. According to Wikipedia, Haggart whistled the melody and play while Bauduc accompanied him on a drum. About halfway through, Bauduc starting drumming on the strings of the bass. Later more elaborate arrangements were made. The version above was performed by the Midland College Jazz Ensemble in Midland, Texas, in 2014. Winnetka is a suburb of Chicago. Nineteen-year-old Sheku Kenneh-Mason played the cello for guests at the wedding of Prince Harry and Meghan Markle. He is one of seven remarkable brothers and sisters who play a wide range of musical instruments.. Theirs is quite a story. Happy Birthday, Jesus by Addison Del Mastro for The American Conservative. The Hurrian Hymn was recorded in Cuneiform notation 3,400 years ago in Ugerit, or New Canaan, in modern-day Syria. It is dedicated to Nikkal, the Hurrian goddess of the orchards, and was discovered in the 1950s. Martin Molin, of the Swedish band Wintergatan, built this machine, which uses 2,000 marbles to make music. It looks like an Animatron video, but it is real. It is made out of manually-operated levers, pulleys and wheels, mostly wood but including some Lego parts. Hat tip to Avedon’s Sideshow. Hat tip for these links to my expatriate e-mail pen pal Jack and his friend Marty. Hat tip to Don Montana for this version of September Song performed by Willie Nelson. Let’s talk about margins by Craig Mod for Medium (via Marginal Revolution). Consummate craftsmanship consists in paying close attention to details of which the public is not (consciously) aware, such as the margins on book pages. Craig Mod wrote that craftsmanship springs from a combination of humility and diligence—humility to accept that you might not have got it right the first time, diligence to keep trying until you do get it right. One of the best compliments I ever was paid was when I was working on my college newspaper, and overheard one of the printers in the composing room say something to the effect that, this Ebersole kid gives you a lot of trouble, but he makes a nice-looking page. Why Walking Helps Us Think by Ferris Jabr for The New Yorker. Scientists have concluded that people do better thinking taking a stroll in pleasant surroundings than they do sitting at a computer. This is true of me. I have always found that when I get stuck in my writing, or some other task, things come together when I take a walk. There’s something about the rhythmic movement of my arms and legs that gets my brain into proper working order. But scientists have found that it is more than that. Walking on a treadmill doesn’t product the same effect. I’ve been reading a lot lately about I.Q. and whether high I.Q. is hereditary. But the thing to remember is that what your Intelligence Quotient measures is how your ability to take I.Q. tests compares with others in your age group. An I.Q. of 100 means you are roughly average. But here’s the thing. The average has been rising over the years as people get better at passing I.Q. tests. Military combat is, I am told, one of the most intense experiences a human being can have. Veterans say that nobody except another veteran can know what it was like, and I am sure this is so. For many, the experience is traumatic. Drumming, music, drama, painting, writing—all can provide ways to come to terms with the experience and heal the trauma. Pinning down prostate cancer by Tim Louis Macaluso for City newspaper of Rochester, N.Y. The fate of every man, if he lives long enough. Hat tip to Jack Clontz and his friend Marty. Helen Keller, who was deaf as well as blind since the age of two, described in the following letter how she was able to enjoy a performance of the New York Symphony Orchestra. I have the joy of being able to tell you that, though deaf and blind, I spent a glorious hour last night listening over the radio to Beethoven’s “Ninth Symphony.” I do not mean to say that I “heard” the music in the sense that other people heard it; and I do not know whether I can make you understand how it was possible for me to derive pleasure from the symphony. It was a great surprise to myself. I had been reading in my magazine for the blind of the happiness that the radio was bringing to the sightless everywhere. I was delighted to know that the blind had gained a new source of enjoyment; but I did not dream that I could have any part in their joy. Last night, when the family was listening to your wonderful rendering of the immortal symphony someone suggested that I put my hand on the receiver and see if I could get any of the vibrations. He unscrewed the cap, and I lightly touched the sensitive diaphragm. What was my amazement to discover that I could feel, not only the vibrations, but also the impassioned rhythm, the throb and the urge of the music! The intertwined and intermingling vibrations from different instruments enchanted me. I could actually distinguish the cornets, the roll of the drums, deep-toned violas and violins singing in exquisite unison. How the lovely speech of the violins flowed and plowed over the deepest tones of the other instruments! When the human voice leaped up trilling from the surge of harmony, I recognized them instantly as voices. I felt the chorus grow more exultant, more ecstatic, upcurving swift and flame-like, until my heart almost stood still. The women’s voices seemed an embodiment of all the angelic voices rushing in a harmonious flood of beautiful and inspiring sound. The great chorus throbbed against my fingers with poignant pause and flow. Then all the instruments and voices together burst forth—an ocean of heavenly vibration—and died away like winds when the atom is spent, ending in a delicate shower of sweet notes. Of course, this was not “hearing” but I do know that the tones and harmonies conveyed to me moods of great beauty and majesty. I also sensed, or thought I did, the tender sounds of nature that sing into my hand—swaying reeds and winds and the murmur of streams. I have never been so enraptured before by a multitude of tone-vibrations. As I listened, with darkness and melody, shadow and sound filling all the room, I could not help remembering that the great composer who poured forth such a flood of sweetness into the world was deaf like myself. I marveled at the power of his quenchless spirit by which out of his pain he wrought such joy for others—and there I sat, feeling with my hand the magnificent symphony which broke like a sea upon the silent shores of his soul and mine. 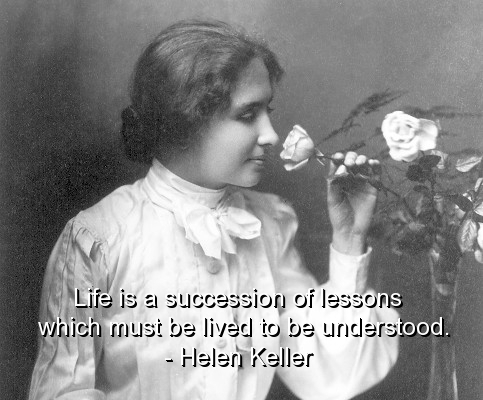 Click on Helen Keller for her Wikipedia biography. Pete Seeger died Monday. He was a great songwriter, musician and fighter for social justice, and a great example of a life of integrity. He sang songs in support of the labor union movement in the 1940s. During the 1950s,, he was blacklisted for his Communist sympathies and nearly went to prison for contempt of Congress after refusing to answer questions by the House Un-American Activities Committee, but made a comeback in the 1960s. I think his illusions about Communism and the Soviet Union were a serious thing to have been mistaken about, but they matter less than his great songs and his example of courage in standing up for what he thought was right. “Union Maid” was composed by Pete Seeger’s friend Woodie Guthrie in 1940 when the two of them were in Oklahoma, performing for the benefit of striking oil workers. Pete Seeger composed “Waist Deep in the Big Muddy” in 1967, and was invited to perform it on the Smothers Brothers Comedy Hour, along with songs of the Revolutionary War, Civil War and World War One. CBS management perceived the political implications and scissored out the song. Seeger fans, including the Smothers Brothers themselves, protested and Seeger was invited back to perform the song in 1968. In this appearance by Pete Seeger on the Johnny Cash Show in 1970, it is clear that Cash regards Seeger as the master and himself as the student. Two things are remarkable about this video. One is the amazing yards-old, gravity-powered forest xylophone that it depcits, and the other is that it was done as commercial advertising. I thank my e-mail pen pal Jack Clontz for the link. I’d never heard of Animusic videos until my old high school classmate Joyce sent me a link to the one above. Click on Animusic for the home page of the company that makes the videos. Click on Animusic for a Wikepedia article. Deaf percussionist Evelyn Glennie demonstrates that listening is done with your whole body and all your senses, and not just by letting sound waves hit your ear drums. Her TED talk is a lesson in how to appreciate music and a lesson in why you should not judge people by their apparent physical limitations. Hat tip to fleurmach | beyond your peripheral vision. This video is a trailer for a documentary to be released next year about the Landfill Harmonic Orchestra, whose 20 or so members are Paraguayan teenagers who play instruments made from recycled garbage. They live in Cateura, a suburb of Asuncio, where reclaiming and recycling material from a landfill is a major industry. Favio Chavez, a musician, had a youth orchestra perform in Cateura, and local teenagers wanted to learn to play musical instruments themselves. But nobody in Catuera could afford to buy musical instruments. A violin would cost more than one of the shacks the people live in. So Chavez teamed up with Nicolas Gomez, a garbage picker, and they figured out how to make musical instruments out of reclaimed trash. A saxophone was made from tin water pipes, bottle caps and spoon and fork handles. A cello was made from an old oil can, recycled wood and a tool used for tenderizing pasta. Juan Manuel Chavez is show in the video playing part of the Prelude to Bach’s Cello Suite No. 1 on that cello. Click on Their Instruments May Be Garbage, But Their Music Will Bring Tears to Your Eyes to read more in Mother Jones magazine. It’s quite a story. Hat tip to Obsidian Wings. I didn’t even know there was a genre called “fanvid” until I came across this a couple of days ago on Obsidian Wings. Click on bironic for details and background information. The New Hot 5, an American jazz band, plays for a herd of cows in Autrans, France. Hat tip to naked capitalism. This is the choir of King’s College, Cambridge, singing “O Sacred Head Now Wounded” from J.S. Bach’s St. Matthew Passion. Hat tip to Ed Kilgore of The Washington Monthly. My favorite Christmas carols are the traditional religious carols sung in the traditional way, but this medley is good fun, too. The outspoken atheist Richard Dawkins prefers the beautiful traditional religious Christmas carols to the 19th century winter songs and the 20th century Santa Claus songs. “All that ‘Happy Holiday Season’ stuff, with ‘holiday’ cards and ‘holiday’ presents,” is a tiresome import from the United States, where it has long been fostered more by rival religions than atheists,” Mr. Dawkins wrote [in Britain’s New Statesman magazine last year]. I saw “Tibet in Song” on a DVD from the Rochester Public Library, which was recommended by my friend Maria Rosa Nachon. It is a great showcase for the traditional music of Tibet. At the same time it documents the attempt by the Chinese government to repress the traditional Tibetan culture, including music, and replace it with their own. Ngawang Choephel, a Tibetan who grew up in the exile community in India, returned to Tibet in 1995 incognito to collect and document traditional Tibetan music. He was able to sent back many tapes and notes, but was arrested and sentenced to 18 years in prison for espionage. The film describes how he and other Tibetan freedom fighters kept up their spirit by singing traditional songs of their nation. He was released in 2002 after an international human rights campaign. He then went to work on this movie, which was released in 2009. The Chinese government broadcasts and distributes Chinese music, much of which resembles Japanese and American commercial music, and also puts on performances of their fake version of Tibetan music. But the real Tibetan music survives. The Tibetan saying is that Tibetan music survives on the mountaintops (because Chinese settlers occupy the valleys). I’ve linked to trailers and short segments that give an idea of “Tibet in Song.” If you have any interest in world music, or Tibetan religion and culture, I recommend you view this movie in full. If it is not available from your public library, it can be ordered from Netflix. Tibet in Song reminds me of another great documentary film, The Singing Revolution, about the struggle of the people of Estonia to preserve their cultural independence and then achieve political independence from a foreign Communist dictatorship. Phil Ochs was one of the preeminent protest singers of the 1960s. He’s virtually forgotten now. As with many figures of that era, I appreciate him much more now than I did when he was alive. Here are the lyrics to “There but for fortune,” which he composed in 1964 (I think). Show me a young man, show me a jail. Some me a pris’ner whose face has grown pale. Show me an alley, show me a train. Show me a hobo who sleeps in the rain. Show me the whiskey stains on the floor. Show me a drunk as he stumbles out the door. Show me a country where the bombs had to fall. Show me the ruins of buildings so tall. A few comments: I get annoyed when people tell me I am “privileged” because I am a straight, white, middle-class, right-handed, Anglophone male without any major physical disabilities, who had two loving parents who taught me to value education, work and consideration for others. It is not as if I had any choice in these matters, or as if everything in life were handed to me on a silver platter, or as if bad things can’t happen to straight white Anglo males. But the fact is that the world is not a level playing field, and I began life on the upside of the field and not the downside. I had a good friend named Talva Chapin, who died recently at the age of 84. She spent decades of her life as a volunteer teacher in New York state prisons, and, though a person of very genteel upbringing herself, formed friendships with supposedly hardened criminals. She said that all of them or almost all of them suffered horrific abuse in childhood—savage beatings and worse—and grew up in a society of unremitting violence. Hardly any of them were literate. They were ignorant of the most basic facts about history and the world they lived in. The race is not to the swift, nor the battle to the strong, neither yet bread to the wise, nor yet riches to men of understanding, not yet favor to men of skill, but time and chance happen to them all. Click on Phil Ochs for a web page devoted to his work. Click on Phil Ochs wiki for his Wikipedia biography. Click on Blue in the Bluegrass for another version of the song.